A phone-camera snap of the view. Realising that it was Easter that coming weekend, we decided to go on the group’s long-awaited trip to Lebanon. Only a few days after Justin left. I guess we subconsciously wanted him to regret leaving us all. Sorry Justin. A few days later we were off! Only a quick flight of just over an hour and we were there. It turns out we flew with the only airline that is still game (read: crazy?) enough to fly over Syria. 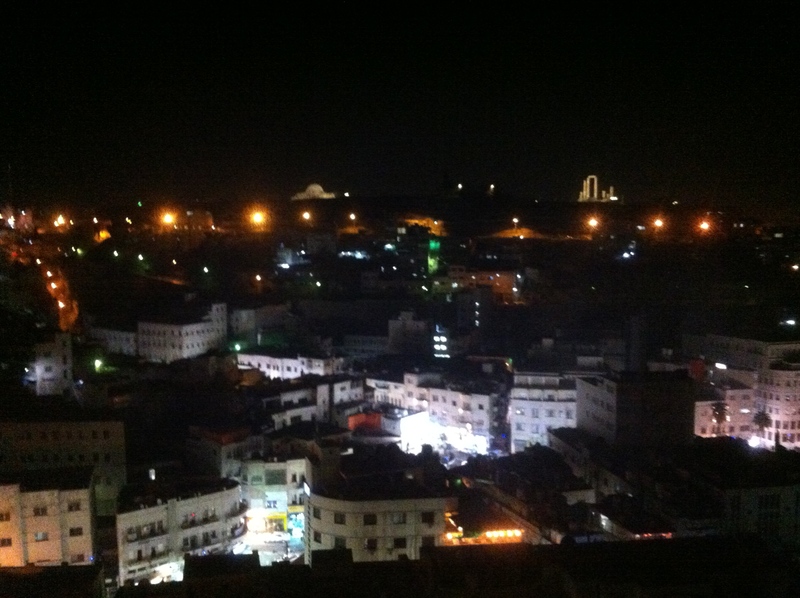 So for most of the trip we cruised straight over Syria, although the plane did skirt Damascus so that’s fine, right? Oops. But we got there in one piece. Next challenge was to be let in. 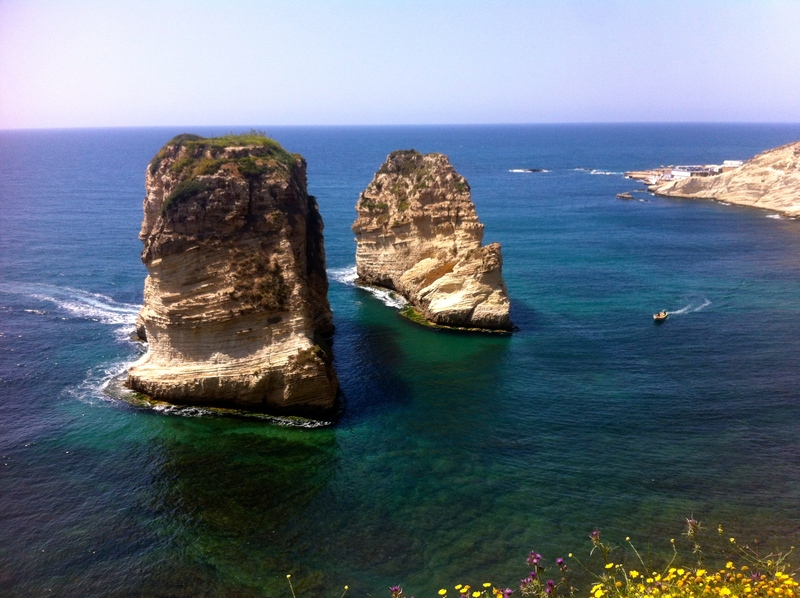 One of the sights we were excited to see in Beirut! Everyone got through customs without a hassle (Well, Michelle did get hit on by the customs officer: ‘have you tried tabouleh?’.. ‘yes.’ … ‘Lebanese tabouleh is the best. I can show you’ … ‘No thanks.’) But then it was my turn. For those who don’t know, you cannot be let into Lebanon if you have an Israeli stamp in your passport. It’s the same in Saudi Arabia, amongst other countries. But I knew this, and didn’t have a stamp. However, I was born in Jerusalem, and it says so in my Australian passport under place of birth. They took my passport to the main office and consulted with each other. They called the owner of apartment we were staying at in Beirut, asked for many more details etc etc. I explained that I was born in Jerusalem because my Dad was working with the UN at the time, helping Palestinian refugees, and we lived in Bethlehem (Palestine) but the hospital was in Jerusalem. No good. (During the explanation one of them had the clever idea that I just change my place of birth. Genius, why didn’t I think of that beforehand…) They required approval from higher up, saying it would take about three hours. Not ok. I wanted to call for help. We couldn’t get a sim card, they wouldn’t let us use their phone, and of course, the pay phones did not function. After over an hour of heated debate (in Arabic may I add- yay! ), I was finally escorted by security to a pay phone on another floor that did work. My calls weren’t too fruitful in terms of getting me into the country, but I had plenty of time for a nice catch-up with my parents. Made paper aeroplanes out of the visa forms, earning strange looks from the guards, some of whom later joined us and made planes that put ours to shame. Sam lifted heavy tables and put them back down again, seriously concerning the security staff. Kara and Michele dance the pain away. Yeah, it got pretty fun toward the end. Nevertheless, five hours later I was finally allowed into the country. And it was great. At least I know that I can argue in Arabic now! ← Update on Arabic progress!